Just did an very similar study but with slightly different source data – see http://www.reflectionsfromtheriver.com/2009/07/meta-analysis-of-ctr-from-natural-search-results-serps/. As you will see from the article, I felt it was useful to publish the regression equation so that differences in CTR could be calculated easily in a spreadsheet to predict click-through rates from keywords with different search volumes. Also, the equation suggests how CTR should change over lower SERP positions (although this is admittedly an extrapolation beyond the original data sources). Great to see actual scientific data on SEO – keep it coming! Great stats. 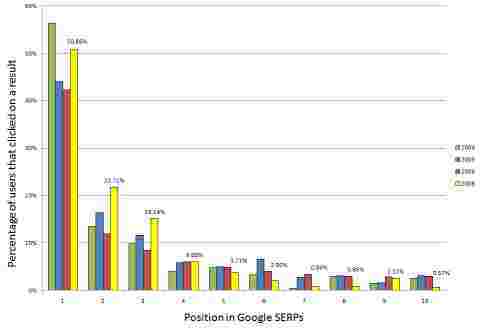 yes it is more likely to get lot of clicks for top 3 positions.Very well organize report. The 2009 article is blocked maybe you have some other researches to share with us? @Mike That is a very nice article you have there. I actually also calculated a regression equation, but refrained from publishing it, since it cannot be correct over a variety of SERPs. As one of your data sources predicts, appearance of Adwords on top of the organic SERPs can decrease the CTR from about 50% (without the Adwords) to about 35% (with the Adwords). Universal Search Results would skew those CTRs furthermore so the formula could be misleading. @agroup you can probably find the article by searching for its title in Google Scholar. If you still don’t find it, let me know, I will shoot you the PDF file. As for other researches, I suggest reading Mike’s article linked from his comment and the studies he refers to. The usability issue is a completely different animal and is much more versatile than the SERP CTR. What I am hoping to start looking into is how changes in different elements in SERP listing affect the CTR. Nice article, and thanks for the SpyFu mention. I did a bunch of research on this stuff recently — lot’s of stuff to take into account to calculate the traffic. In addition to the Universal search stuff, there’s the presence, quantity, and quality of ads. Anyway, we built an algorithm off of my research, and its been up on SpyFu for a couple weeks. To get to it, download a domain’s organic keyword list. For each keyword that a domain ranks on organically, we calculate the amount of traffic delivered to that specific domain on that specific keyword — and we also take a stab at how much all those clicks are worth. The value estimate is handy because it gives you something to go to your client or your boss and show them how much you’re worth to them. Interesting article and some good figures to back up the claims. I wonder how the figures will change over time…particularly as people seem to be searching more via long tail terms these days. Will this result in a higher percentage of clicks through to position 1? – more defined search terms may mean users are expecting Google to deliver more efficient results, and so, they may not go past the top result. Good roundup of the available data, interesting to see how closely they agree on the spread of clickthroughs from page 1. However my issue with all of these studies has always been that CTR surely varies greatly depending on the type of query. No doubt the vast majority of navigational queries hit the #1 result. But I’d speculate that for other types of queries people are more willing to scroll down and look for the most relevant listing, and even go to page 2 or 3, or refine their query to something more specific. A known brand name will probably also get more attention even if it’s further down. And I think people are getting more sophisticated in using search engines over the years so the blind clicking on the first few is becoming less common. But as I said this is all speculation, and generally these studies are a good starting point. Thanks for posting this analysis. I think it really depends on how large of an industry and how much competition to see if someone makes it past the first page. Some industries have really great search results even all the way back to the 5th page. Interesting conclusion, any chance you can reload the CTR image as it doesn’t load when clicked on. Hi…….thanks for this informative discussion. it all depends on how much competition to face if other makes it past the first page. some industries have better result even at low page. Very interesting matter, well made! Congratulations! yes it is more likely to get lot of clicks for top 3 positions.Very well organize report. Interesting conclusion, any chance you can reload the CTR image as it doesn’t load when clicked on. Thanks for sharing. Thanks for the stuff. Good roundup of the available data, interesting to see how closely they agree on the spread of clickthroughs from page 1. Really good. Interesting statistics and insight, but as also pointed out by @ Jaamit SEO the type of query will definitely effect click trough rates. it’so nice to find an updated article about distribution of CTR in SERPS..
A lot of people in the SEO game and also clients willing to involve themselves in SEO get caught up in the dream that high positions increase site traffic and in turn increase revenue and the return on investment will be worthwhile. What goes forgotten is having a totally unusable/poorly designed website. Even if traffic find their way to your site-it’s then up to your site to convert that traffic. The conversion is king-a site which is designed well and usable on the 2nd page of the SERPS will do better than a badly designed site on the 1st page. Just something to bear in mind when in SEO Manchester. Thanks, for the well-done post. However, the last paragraph suggests that SERP quality has diminished over time due to gravitation of clicks to lower positions. I don’t think this is the case; search quality has almost certainly improved since 2004. I think this trend can actually be explained by the evolution of the browser and growth in tabbed browsing. While I don’t have hard data to back this up, my observation is that users are increasingly right-clicking several results from the SERP and queuing them up in separate browser tabs. Then, they’ll leave the SERP to scan their top choices. Thanks for sharing, very usuful! It really amazing the percentage different between position #1 and #2. Given that these data go back to 2004, Do we still browse the web the same way as back in 2004, now that most people are using bigger monitors, higher screen resolution, and more computer friendly? So is this data still valid? This must be one of the most helpful articles I have read lately. Clearly, even if you have a Top 3 or Top 2 ranking, you can increase your visit numbers immensely by going up just one or two spots. Do you have any data newer in respect to personalized search and real time search? Very useful and insightful. Newer data would be great. As mentioned in an earlier comment, having some insights on the impact of AdSense and other ad-related items within the SERPs would also be very useful. Thanks for the well written article. This is a good analysis but I am not so sure on if people do actually go to the second page and click on any listing, hence Google has applied for the long tail key phrases to be listed from their May day update. I feel that issue with all of these studies has always been that CTR surely varies greatly depending on the type of query. CTR also varies depending on your budget, the bigger the budget the longer you list. Think you have great stats. Hoping to see more soon maybe from 2009 – 2010.